At The Eagle Companies, we focus on the details of every project – both interior and exterior – and you, our client. 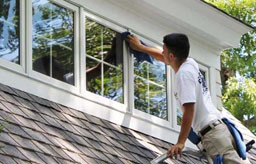 We recognize that home and business washing, painting and window cleaning is not an everyday occurrence for you. There is some education and preparation that needs to occur to ensure your project goes smoothly and according to your expectations. We do everything we can so that you are comfortable with the process, and to make it the best possible experience for you! WE ARE CERTIFIED, LICENSED & INSURED. Eagle Wash is the only company around that offers you a choice between cold and hot washing. We offer high-pressure power washing and low-pressure washing. Fully licensed and insured. Interior and exterior painting for residential and commercial properties of all sizes. 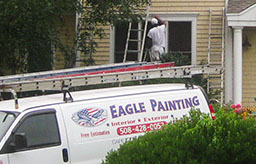 Eagle Painting is known for its exceptional attention to detail and exemplary customer service and satisfaction. Salty sea breezes are one of the joys of living on Cape Cod. But those ocean breezes coat your windows with an unwanted film, even if your home or business isn’t right on the water.